This "Arch de Cagnes" tapestry shows the work of artist Sam Park. Park was born in South Korea and travelled to Paris, France, where he studied art, and developed his unique style reminiscent of French impressionists. He subsequently lived in Greece and Cyprus where he was commissioned by the President of Cyprus, to create the First Lady's portrait. He now resides in Southern California and has exhibited his works in exhibitions including the New York Art Expo. Here we see a French provincial village where the cobbled lane runs down the hill to the village below and a hint of the picturesque hills in the fat distance. Cagnes is a commune in the Provence Alpes Cote d'Azur region in south eastern France. The archway leads the eye on, and is decorated with small leaves and flowers. 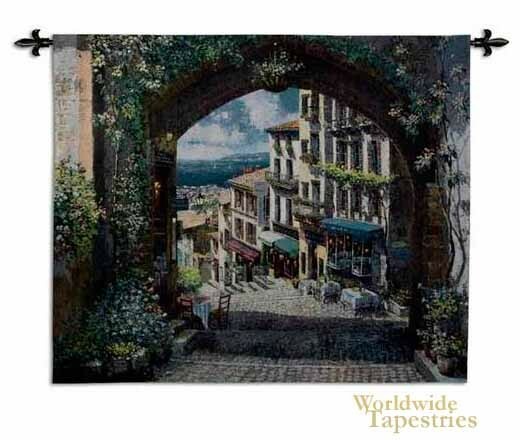 This cityscape tapestry "Arch de Cagnes" is backed with a lining and has a tunnel for ease of hanging. Note: Tapestry rods, where pictured, are not included in the price. Dimensions: W 53" x H 46"